Thais seek foreign investment in infrastructure, automotives, electronics, tourism, and robotics. Arthayudh Srisamoot, director general of the Department of International Economic Affairs, Ministry of Foreign Affairs, introduces Thailand's policies to attract foreign investment and support for the Belt and Road Initiative. Thailand expects trade and investment with China to increase under the Belt and Road Initiative as Bangkok unveiled incentives for foreign investment. 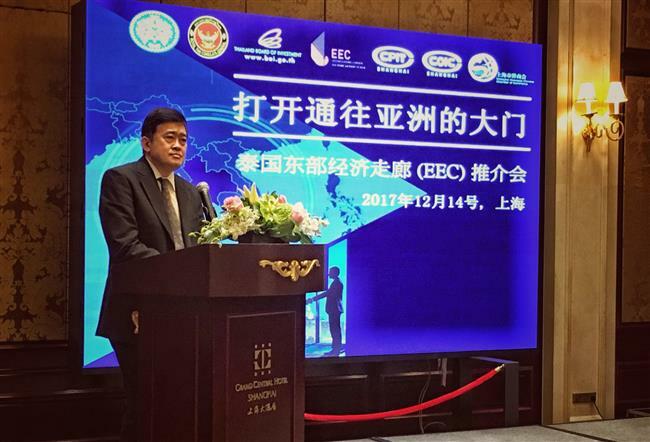 "Thailand supports very much the Belt and Road Initiative which is meant to improve prosperity and benefit for people and countries,” Arthayudh Srisamoot, director general of the Department of International Economic Affairs, Ministry of Foreign Affairs, told Shanghai Daily. “Greater trade and investment will connect countries closer to each other and lift incomes of the people." He said Thailand would like to focus on cross-border trade in commercial goods and agricultural products, investment in high technology and logistics as well as cultural exchange between people of the two countries. Foreign investment is welcomed in building airport, ports, railroads, and government supported industries of automatives, electronics, tourism, robotics, and environment protection. Thailand will offer companies exemption from corporate income tax for as long as 15 years, and ease regulations to facilitate high value investment, officials said.